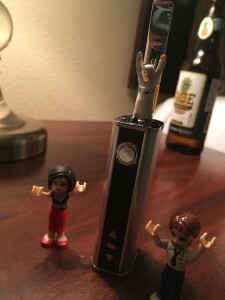 tinyjennandchad are excited for all the new cannabis products, and so is the flying nun! It’s a big day for Oregon cannabis sales! No longer restricted to 7 grams of flower, dispensaries will now be allowed to sell adult use customers over the age of 21 low dose edibles (5 milligrams of THC per serving in packages that sell up to 15 mg THC total), topicals, and pre-packaged concentrate cartridges. It’s clear what that means for edibles. It’s a little less clear what that means for extracts. The law is pretty vague, stating only that “prefilled receptacles of cannabis extracts” are permitted for sale, and goes on to define that as “a single use cartridge prefilled with a cannabinoid extract by itself.” Most people initially took that to mean c02 extracts and similar products that come already loaded and require the use of a battery. Our friends at The Loud 100, however, have speculated that this might include any kind of extract or concentrate, including bho and other forms of hash, so long as it comes in a single serving container that arrived at the dispensary packed and sealed. When we were younger we would sneak down into the basement to smoke pot and play Tetris on an old Nintendo, and that game came on what was called a video game cartridge, so WRK is wondering if it’s possible to get one of those stuffed with some high quality-extracts. It’s a cartridge, right? The important thing to remember, however, is that Weekend Review Kit is no longer operating from the confines of a prohibition state. We are on the ground in Rip City, and we promise to get to the bottom of this by the end of the day. Check back for updates! Posted in Features, The Future of Legalization and tagged adult use, bho, cannabis, co2, concentrates, cookies, edibles, extracts, flower, hash, infused, marijuana, new rules, oregon, portland, recreational sales, topical.